How long does it take for an addict to change? By mcampbell|2018-10-24T10:45:16-04:00August 17th, 2012|The Path of Addiction Recovery|Comments Off on How long does it take for an addict to change? I recently received a call from the wife of an addict in recovery. She was pleased that her husband was no longer using, but frustrated that his behavior continued to reflect many of the characteristics that had been a source of pain and anger during the years of his drug addiction. How long would she have to wait before he changed back into the man she had married? Why was he not thinking clearly now that his brain was no longer fogged with the daily use of prescription medications? What this woman failed to realize was that abstinence from drinking and using drugs is only the first step in the journey we call recovery. While obviously a very important milestone, there is much more to be accomplished than the progress seen in the first few weeks of sobriety. Recovery is best understood as a life-long battle for wellness against a chronic brain disease that can be subdued, but never fully conquered. Gaining the upper hand against the physiological power of addiction is often the easier challenge. 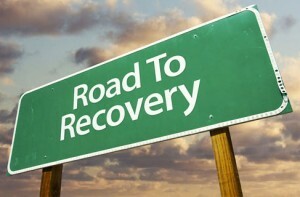 The body begins a process of renewal soon after the use of drugs and alcohol ends. With the help of good nutrition, exercise, and better lifestyle habits, health will return. Researchers believe the lingering physical effects of addiction in the brain can last for 12-18 months, with the greatest improvement occurring in the first 30-60 days. The real struggle is with the psychological dimension of addiction. The addict or alcoholic has used their drug of choice to manage their emotions and take away the negative effects of pain, anger, stress, sadness, anxiety and grief. For the first time in years – or decades – they experience a full range of human emotions and must learn to face them, rather than use their addiction as a means of escape. Learning to live life very differently, when their addiction is constantly urging them to return to their old behavior, is the true battle. Responding to life’s events in new and better ways is the never-ending challenge of recovery. With time it may get easier, and it may be less difficult to make good choices, but the psychological pull of the addiction never leaves. The addicted brain constantly reminds the person in recovery that there is an easier answer. Like the Sirens of Greek mythology, there is a part of the addict’s brain that keeps calling for them to return to drinking or using. It must also be realized that recovery is an individual journey that builds upon the life experiences and temperament of the person. Some people are willing to accept change, and embrace new ways of thinking, while others rebel and plead to embrace the status quo. Fear can be a large impediment for many, while others wrestle with pride, low self-worth or a reluctance to admit their weaknesses or selfish tendencies. Recovery is all about personal growth – which comes quickly to some and through slow, painful steps for others. We cannot impose a calendar for recovery on the person who has stopped using drugs or alcohol. The process of physical and psychological change is too complex to be mapped out with precision. All we can be sure of is that overcoming addiction requires a determined effort to constantly grow and move forward. Recovery can be likened to walking up the down escalator. If you stop moving forward, you will quickly return to the bottom. While it can be frustrating for family members to wait for progress that can at times be painfully slow, there is a positive side that merits consideration. The addict finds freedom from their disease through a constant effort to understand themselves and manage their emotions, thoughts and impulses in ever better ways. Each day in recovery is a day dedicated to beating a disease that seeks to destroy the individual and those around them. Every 24 hours without drinking or using is a victory to be celebrated. People in recovery always have a reason to be grateful. This is a lesson they can share with the rest of the world — which often fails to count its blessings.